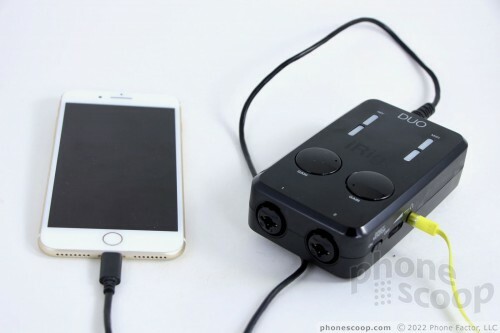 The iRig Pro Duo from IK Multimedia lets musicians plug two musical instruments or microphones into their mobile device for recording whatever you care to record. 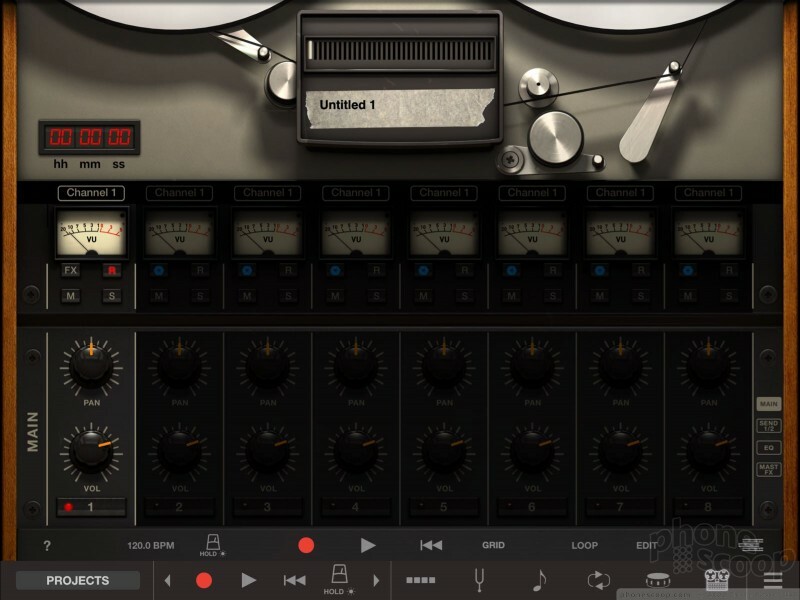 This flexible piece of hardware works hand-in-hand with IK Multimedia's own software, as well as third-party recording apps. 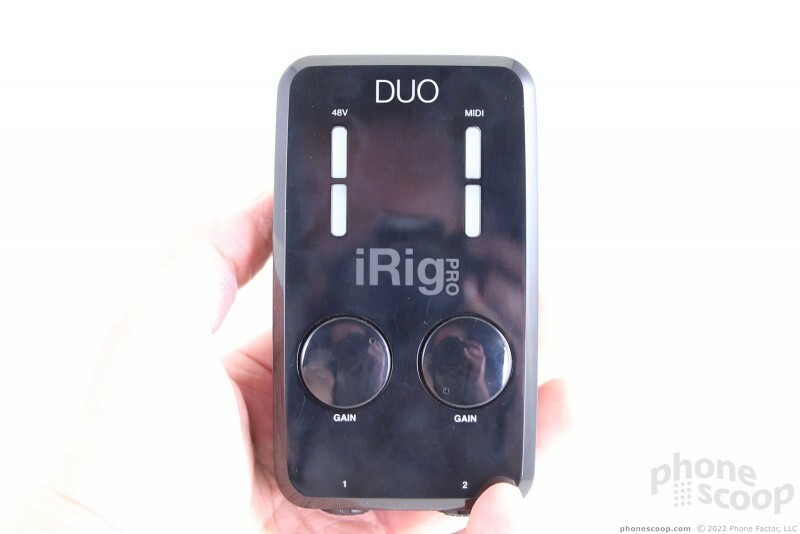 If you're a guitarist, bass player, singer or podcaster looking to lay down your ideas and record two instruments at a time, the iRig Pro Duo can help. Most long-time readers of Phone Scoop probably know that I'm passionate about music. I'm nearly always listening to tunes, and I often enjoy spending my spare time playing guitar. I'm no Eddie Van Halen, but I have enough skill and musical sense to put together some riffs and turn them into songs. 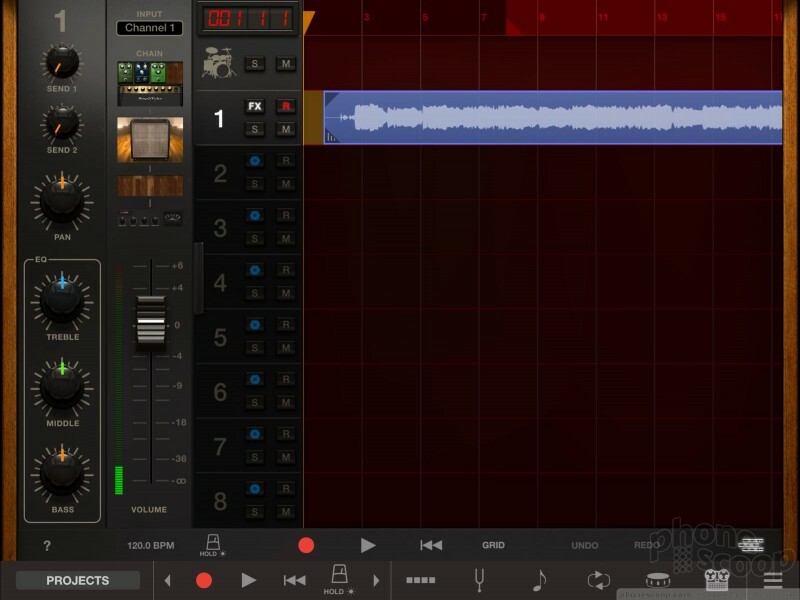 It's one thing to pen a song, and quite another to record it in a way that's clean and usable. Traditional recording equipment for guitars, vocals, bass guitars, and keyboards requires microphones, multi-track recorders or input boards, controlled environments, and more than a little bit of know-how. Thank goodness today's smartphones and tablets have mostly negated the need for expensive, bulky gear and booking studio time. 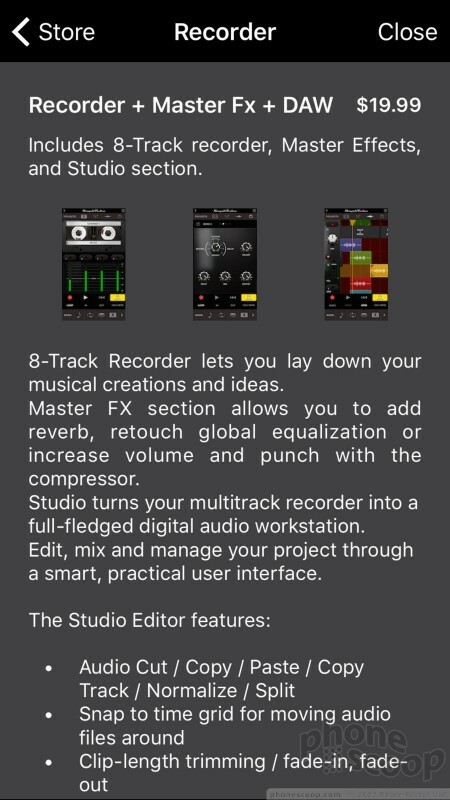 Now, practically anyone can write and record a hit record from their basement or bedroom. 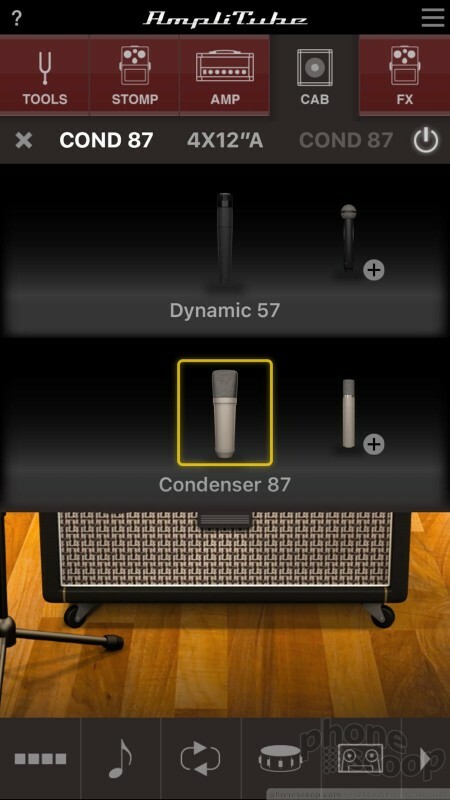 There are lots of apps out there that let you record music on your smartphone or tablet, but first you have to connect your guitar, mic, bass, or keyboard to that smartphone for the cleanest results. 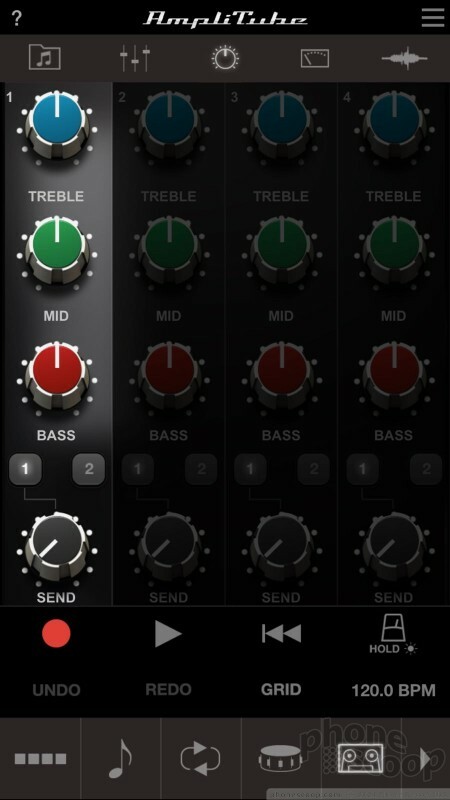 IK Multimedia and many other companies make a wide range of interconnects that allow you to turn the analog signal from your instrument into a digital signal compatible with your smartphone or tablet. 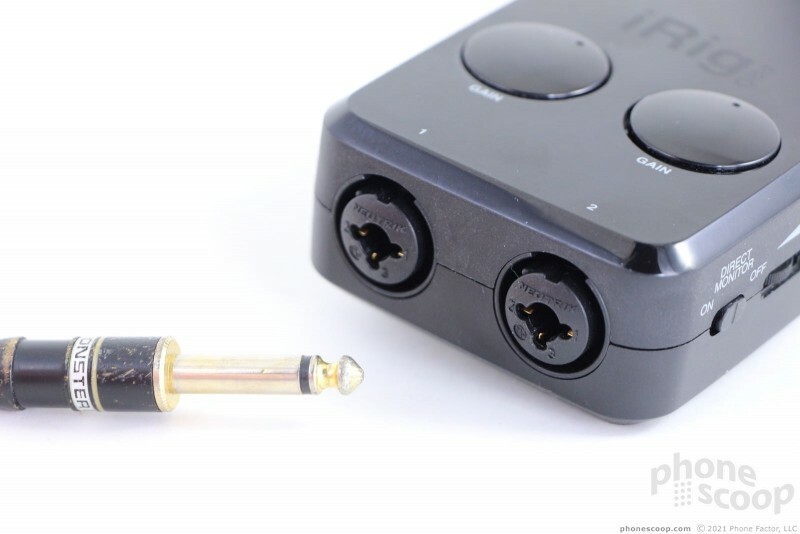 The iRig Pro Duo is the latest such interconnect from IK Multimedia and it (literally) goes one step further than many competing products by allowing you to record two instruments simultaneously. 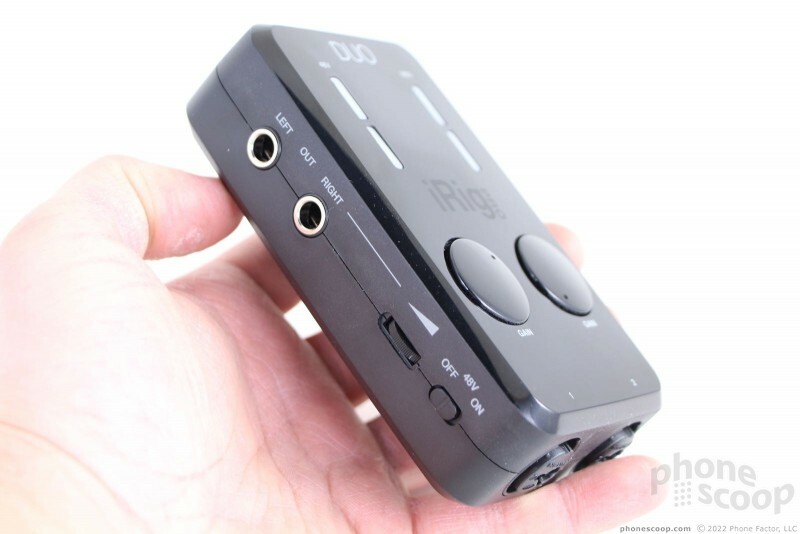 The iRig Pro Duo is a compact plastic box. To my fellow guitar/bass players, I'd say it's about the same size as a stomp box. To everyone else, it measures 5 x 3 x 1.5 inches. In other words, it's not pocket-size, but it's small and light enough to carry around in a bag or satchel. The plastic materials feel tough, if not overly rugged. There are ports, dials, lights, and switches all over the place. 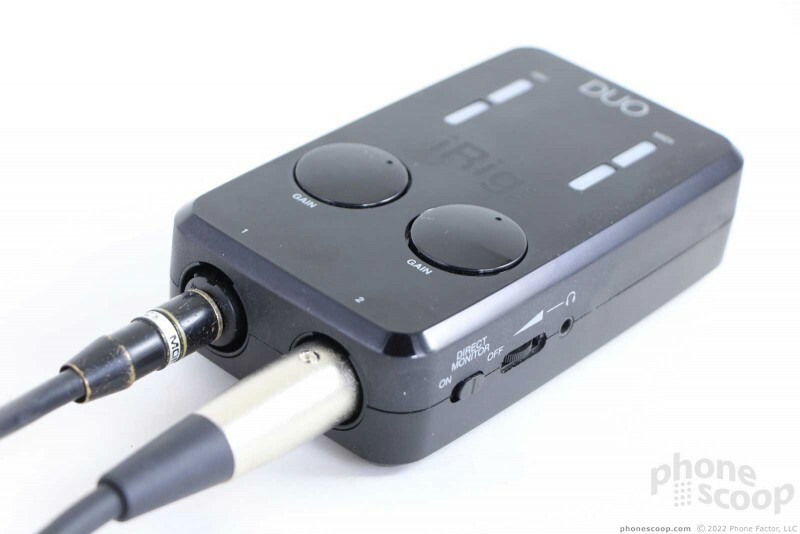 The Pro Duo's face is where the main input controls are for each of the two channels. You'll see two strips of light that let you see what sort of input levels you're reaching, with rotating gain controls beneath. 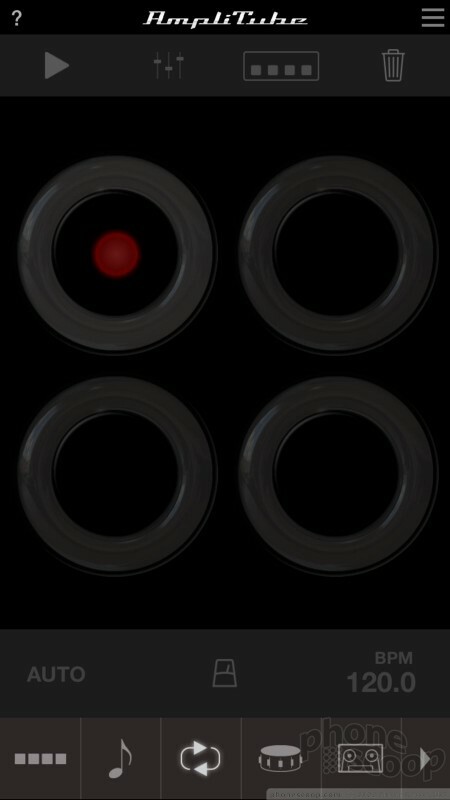 The gain controls spin nicely, but it can be hard to see exactly where the gain level is set. The main inputs are on the bottom edge. The inputs can handle a standard Â¼-inch instrument cable or XLR mic cable. The left side houses two balanced (L+R) outputs for monitors or studio speakers, as well as an on/off switch for the 48v phantom power control (for condenser microphones). 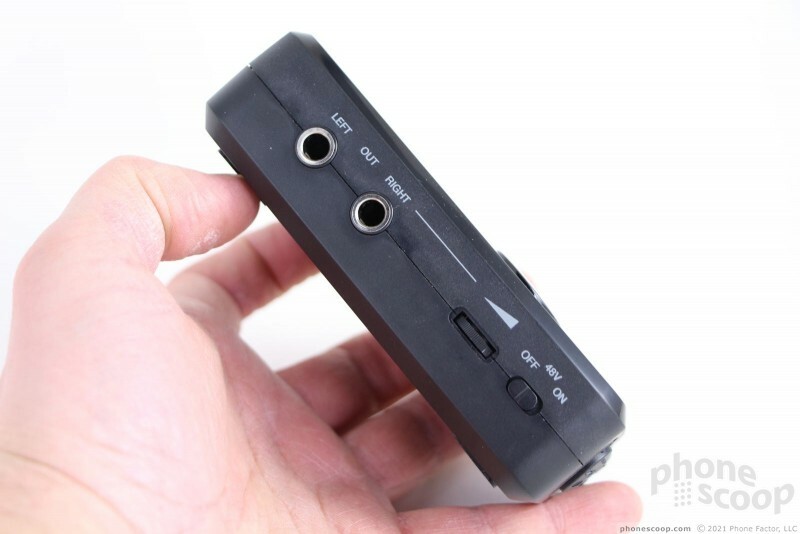 The right edge holds a â…›-inch (3.5mm) output jack for headphones or small speakers and lets you hear your clean signal if you want. It has its own volume dial, which works fine. 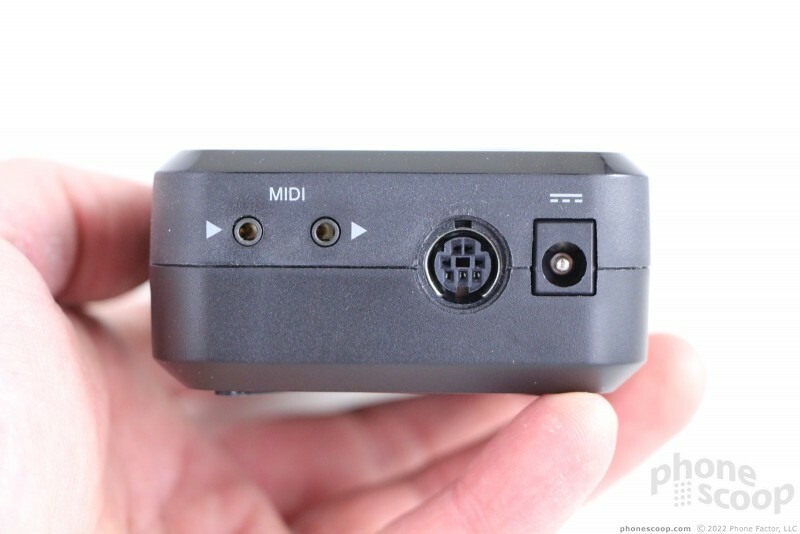 The top edge has two â…›-inch (3.5mm) MIDI outputs, as well as the main port for connecting the Pro Duo via USB to your iPhone, iPad, Mac, or Android device. The rear has four rubber feet, one in each corner, to hold the Pro Duo in place when set down. 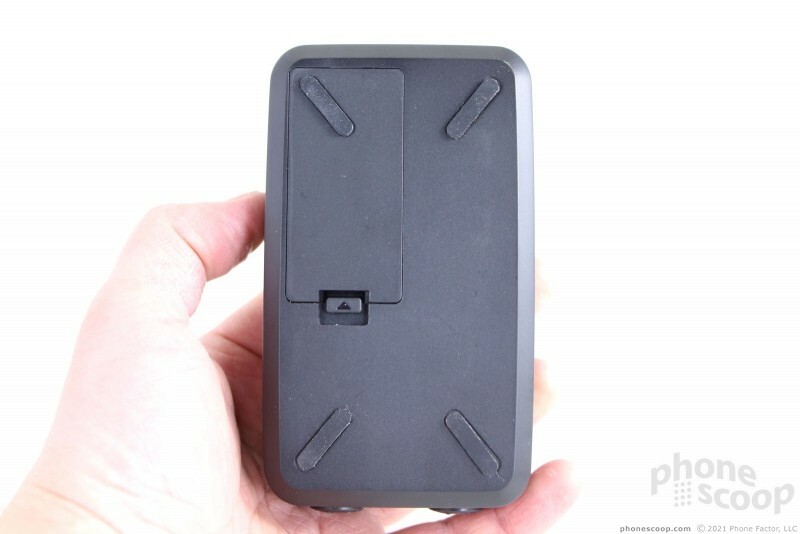 You'll find a small hatch that provides access to the battery compartment. 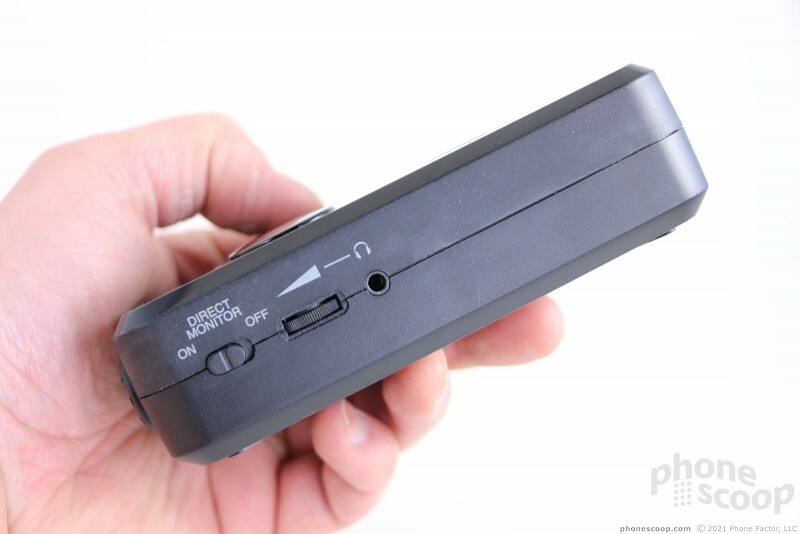 The Pro Duo works perfectly on two AA batteries when on the go. A plug-in power supply is not included, but there is a 9V input for one. 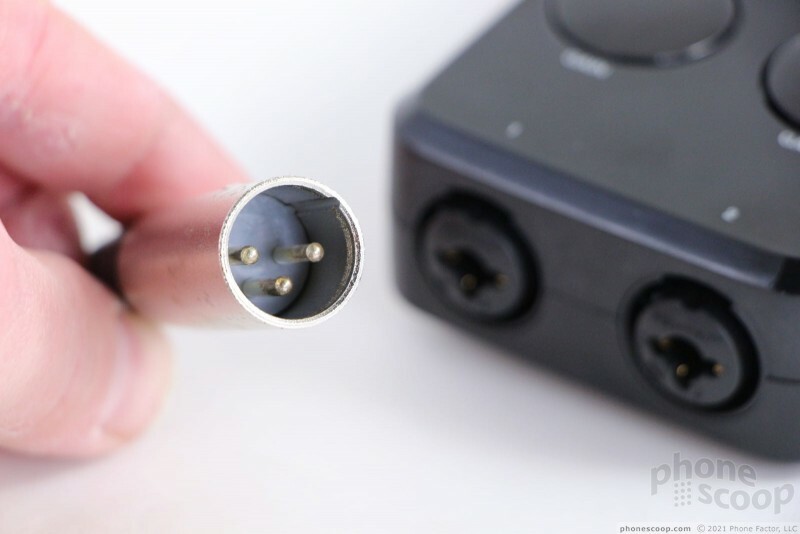 At its most basic, you'll need to plug your instrument or mic into the bottom, and then use one of the included cables to connect the Pro Duo into your mobile device. Used to its full potential, you might have as many as nine cables snaking out of this thing. Speaking of cables, IK Multimedia gives you everything you need. 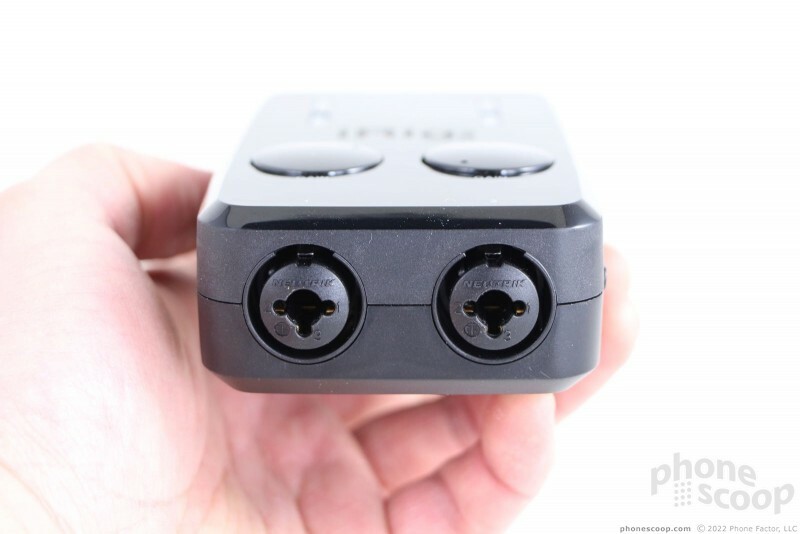 The main output port is a proprietary 7-pin job, and the box includes Lightning, microUSB, and USB cables for connecting to iOS devices, Android devices, and computers (sadly, no USB-C). The Pro Duo becomes a bit unwieldy the more cables you plug in, but the plethora of options is great. 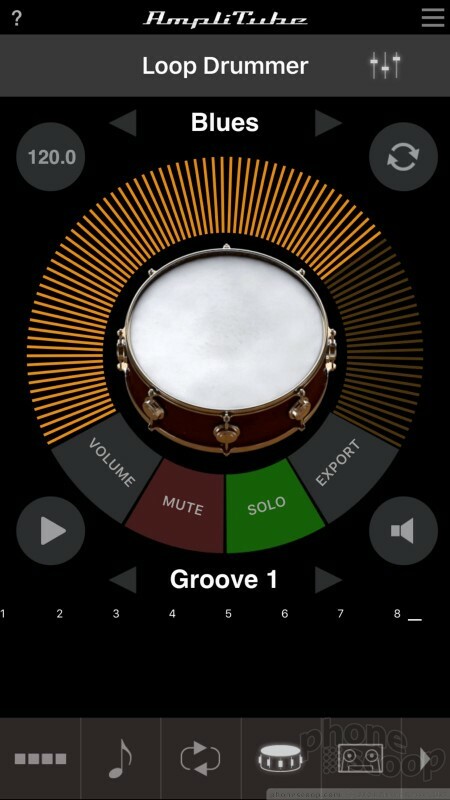 IK Multimedia expects that you'll use the iRig Pro Duo with its software, rather than some other app. 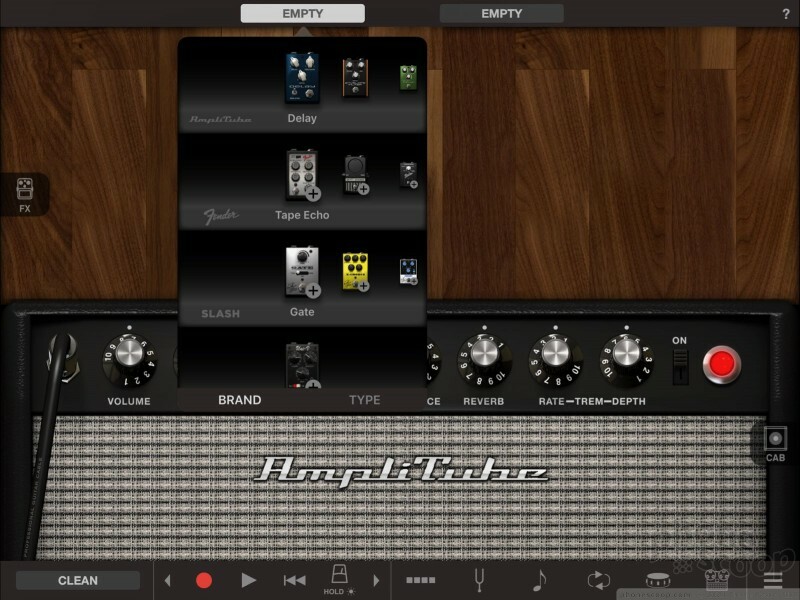 It ships with what IK Multimedia says is more than $400 of free software — chiefly its AmpliTube application for guitars and bass guitars. 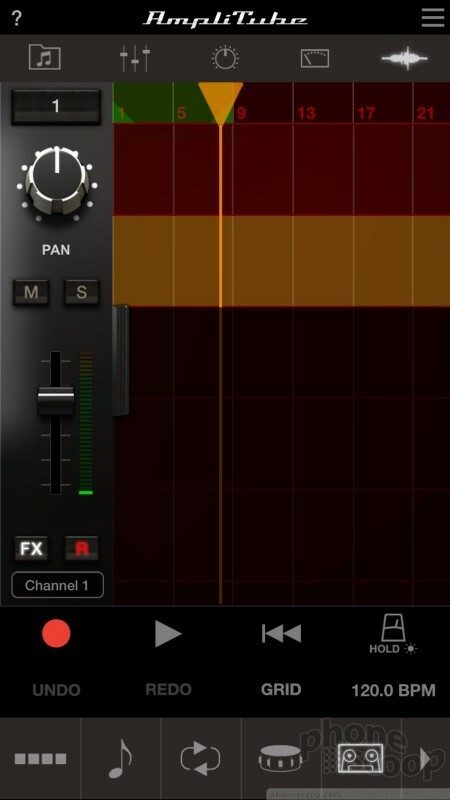 The iRig Pro Duo also gives you access to IK Multimedia's VocalLive, iRig Recorder, SampleTank, and iGrand Piano iOS/Android apps, as well as a handful of similar apps for Mac/PC computers. 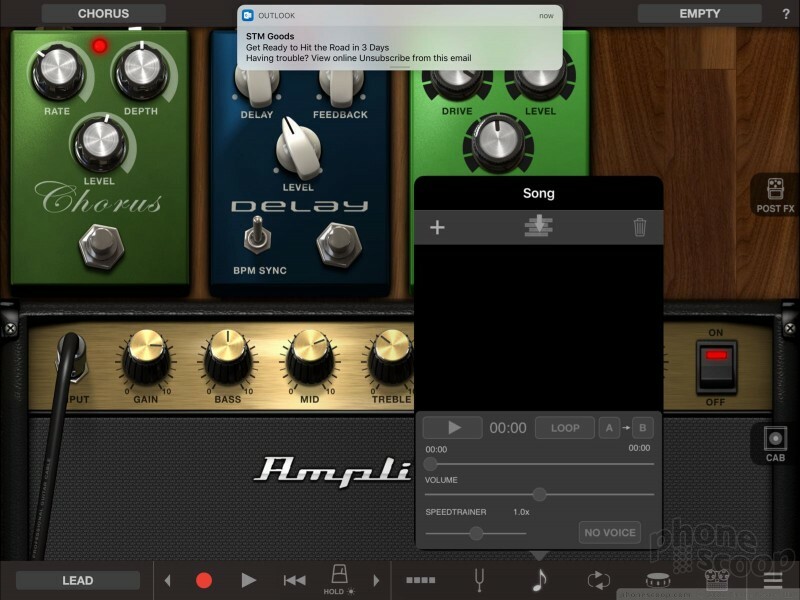 If you're a guitarist or bass player, AmpliTube is probably the main app you'll use with the iRig Pro Duo. I tested it on the iPhone and iPad, but it's also available to Android devices. 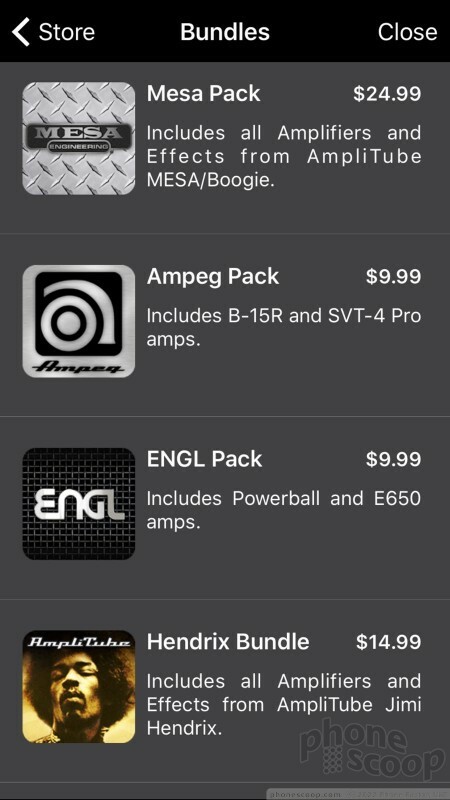 The basic app may be free, but all the fun stuff is only available in the form of in-app purchases. 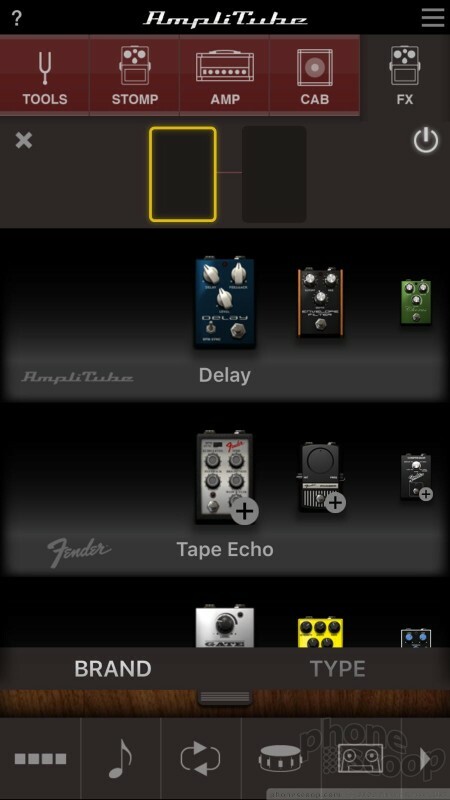 The app provides access to four basic guitar voicings: clean, crunch, lead, and metal. They are IK Multimedia's generic voicings. It also includes several voices for bass guitar. 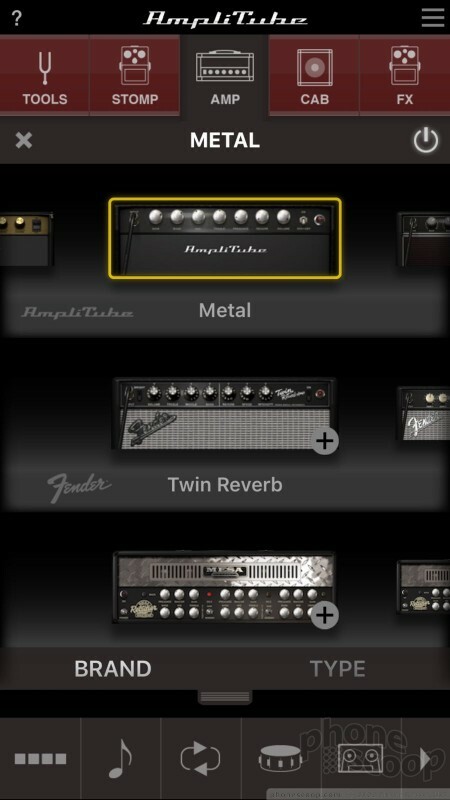 You can tweak gain, treble, mid, bass, presence, reverb, and volume controls for each amp style. 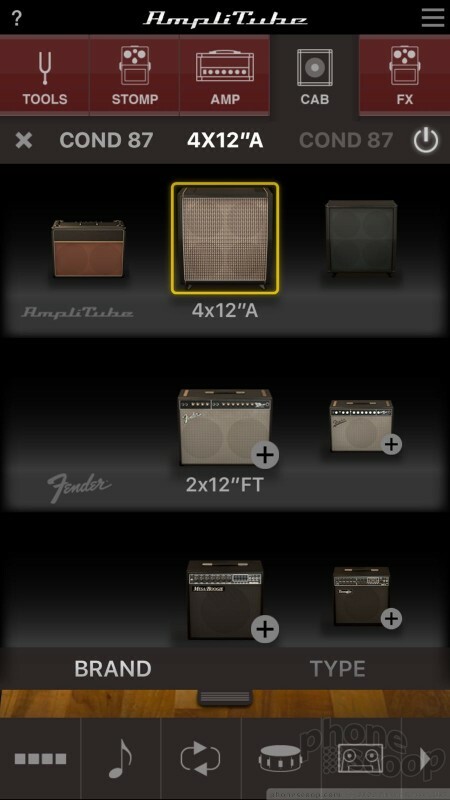 Each of these amps can be paired with several different cabinet styles (1x12, 2x12, 4x12A, 4x12B), two different mics, and about a dozen free stompboxes. Changing any one of these in the chain impacts the overall sound in a noticeable way. 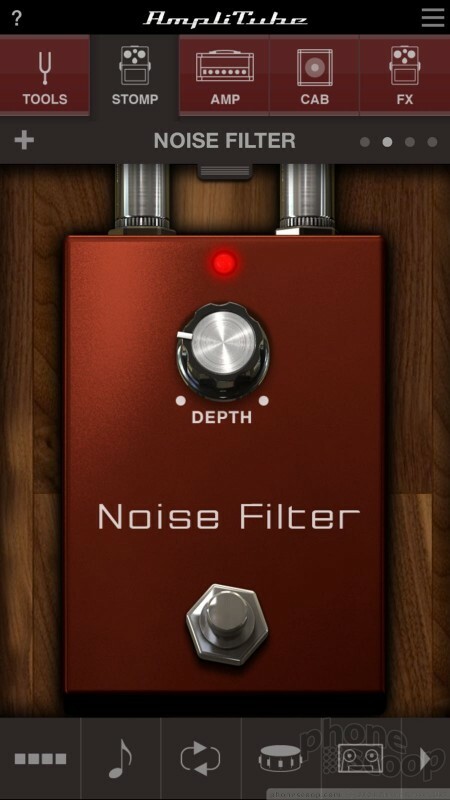 For example, you can use the crunch voicing with a 2x12 cabinet or the lead voicing with a 4x12 cabinet and then apply a different mic or stompbox effect, such as the phaser or wah. 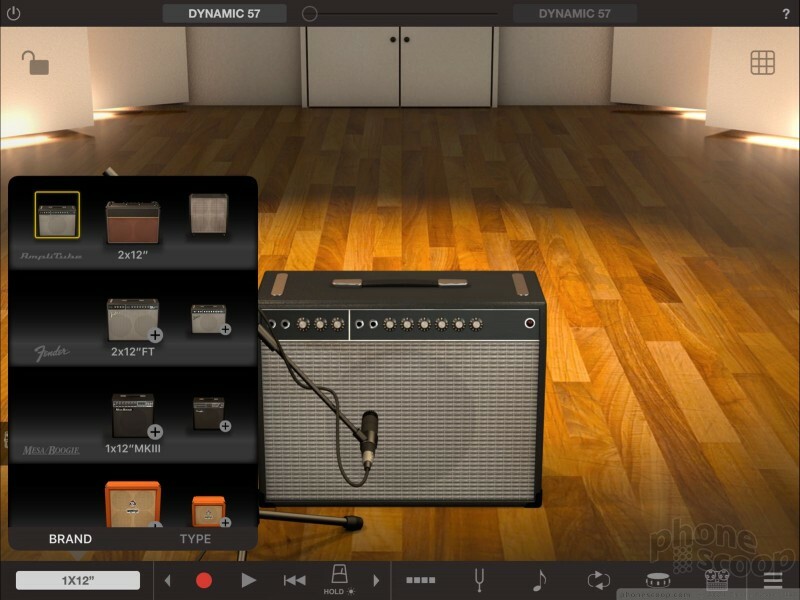 Want to tap into a virtual Fender amp? Expect to pay up. 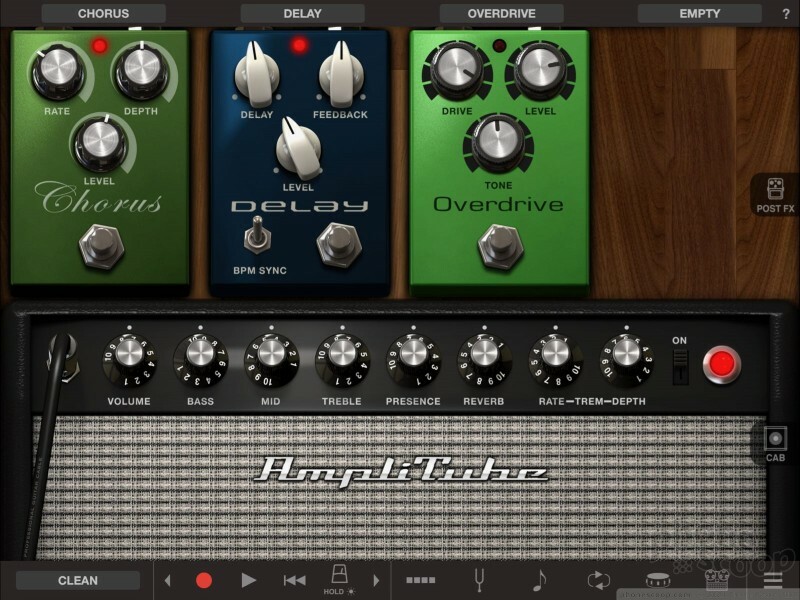 You can buy specific amp voicings or a complete range of amps from a few brand names, such as Mesa Boogie, Ampeg, ENGL, Soldano, Marshall, and Orange. 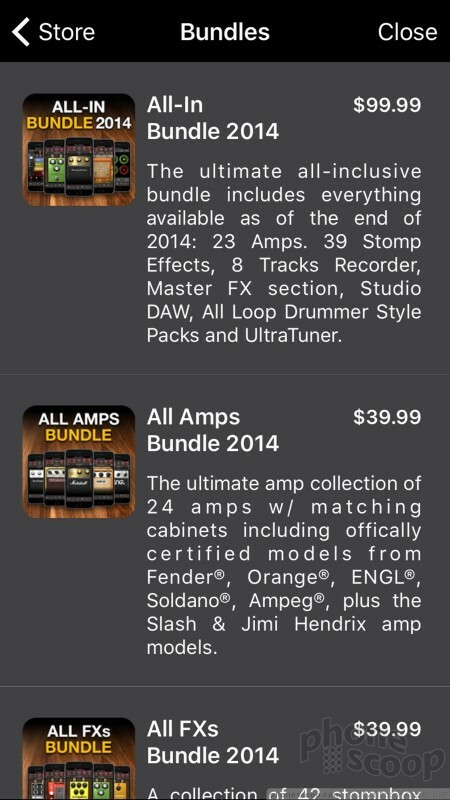 Single amps cost $10, while full amp packs cost $25. 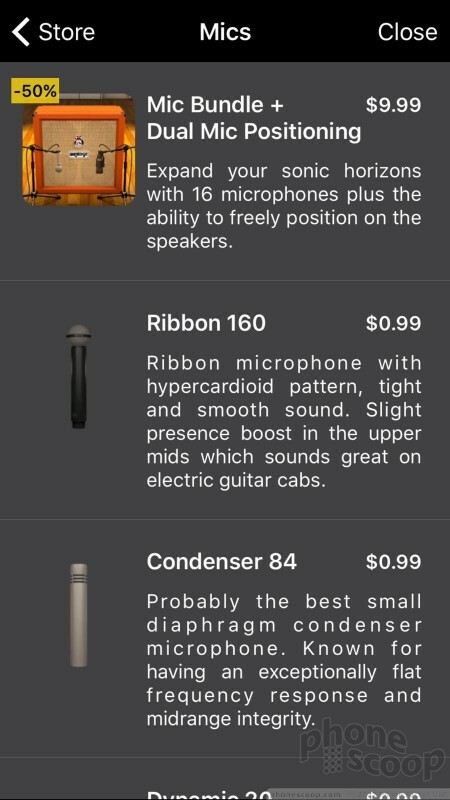 The same is basically true of the software for specific stompboxes ($3), cabinets ($7), condenser mics ($1), and so on. 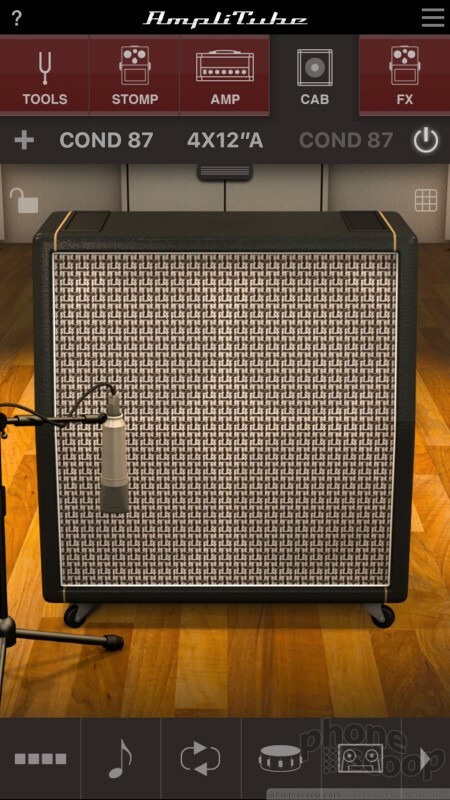 Want to sound just like Jimi Hendrix? 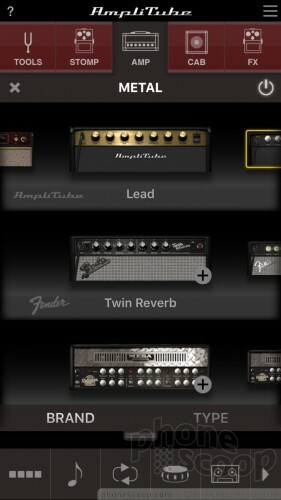 The Jimi pack includes his favored amp and stompboxes and costs $15. 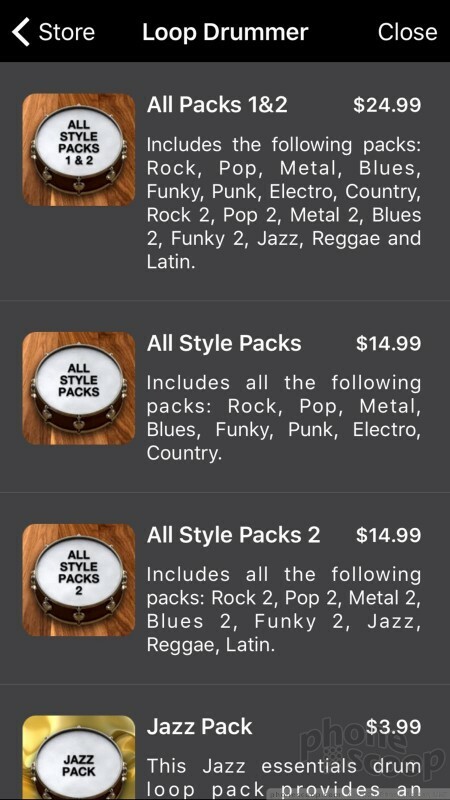 IK Multimedia offers mega packs that include various groupings of these, but then you're looking at real money ($40-$100). 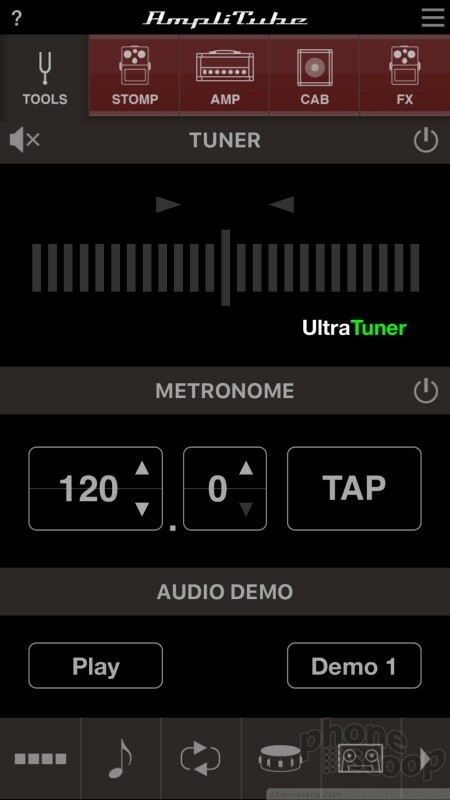 Like Apple's GarageBand, it takes time to assess AmpliTube, find the controls you want/need, and dial in the sounds you're looking for. 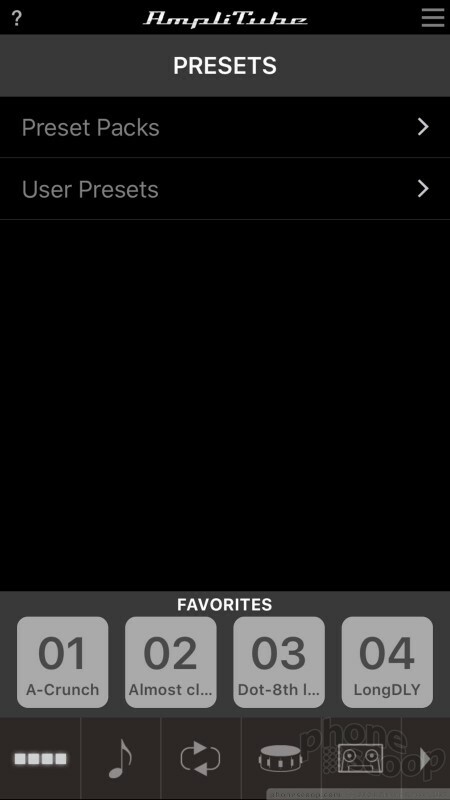 There are some usability problems here and there, especially on the iPhone. 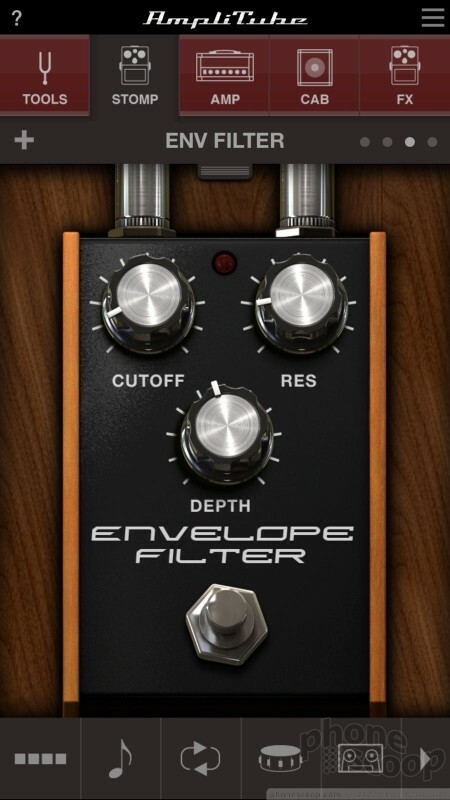 Amp controls are only visible three at a time, for example, which means you can adjust gain, treble, and mids, but then have to slide the console sideways to access the low, reverb, and presence controls, and once more to tweak the output volume. This would be solved if the app worked in landscape mode (like it does on the iPad), but no joy here. Things I like about the app: AmpliTube includes a tuner, metronome, drum loops, and a really fun tape-reel recording UI. 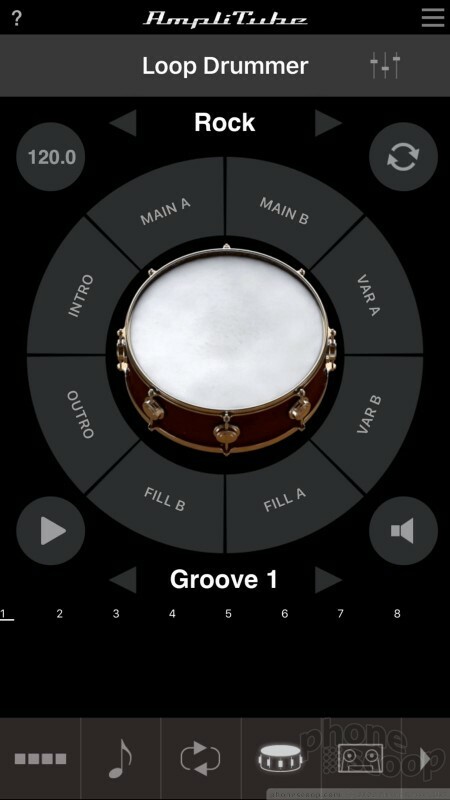 The drum kit lets you add fills or intros, you can set automatic bass lines, and more. 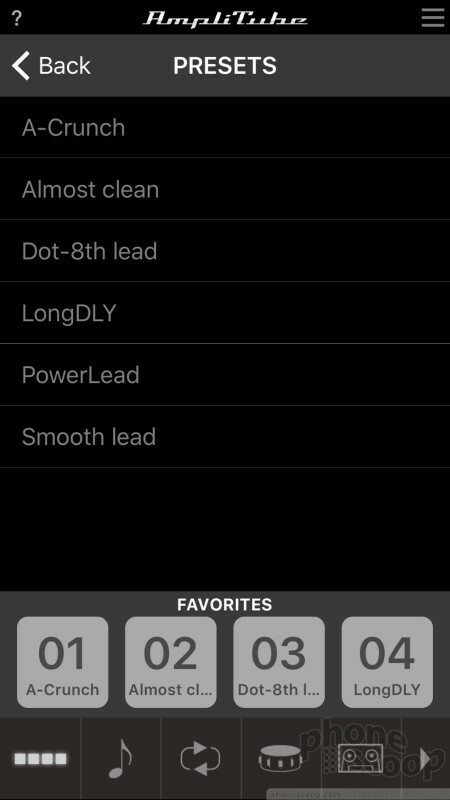 Controlling any/all of these individual tools is straight-forward and easy to manage. Things I don't like: You can only record one actual track at a time. 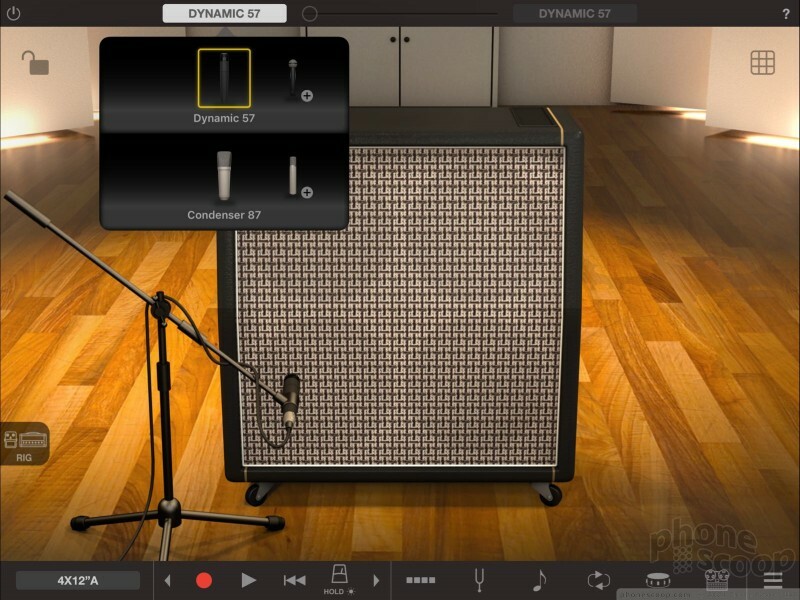 You may be able to plug in a guitar and a microphone, but both voices are patched into the same actual track. 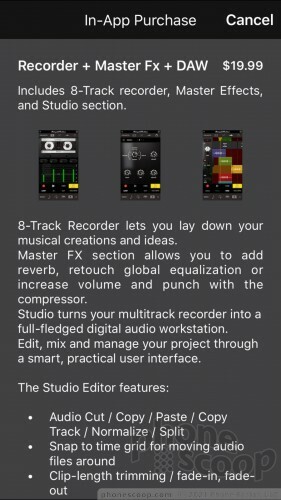 Want multitrack recording? Pay up. You get 8-track recording for another $20. 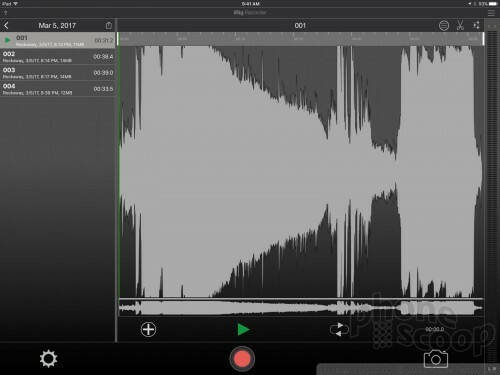 Editing tools, too, are somewhat limited unless you pay for the more extensive recording pack. I understand that everyone has a different budget, but I don't think I care for IK Multimedia's approach here. 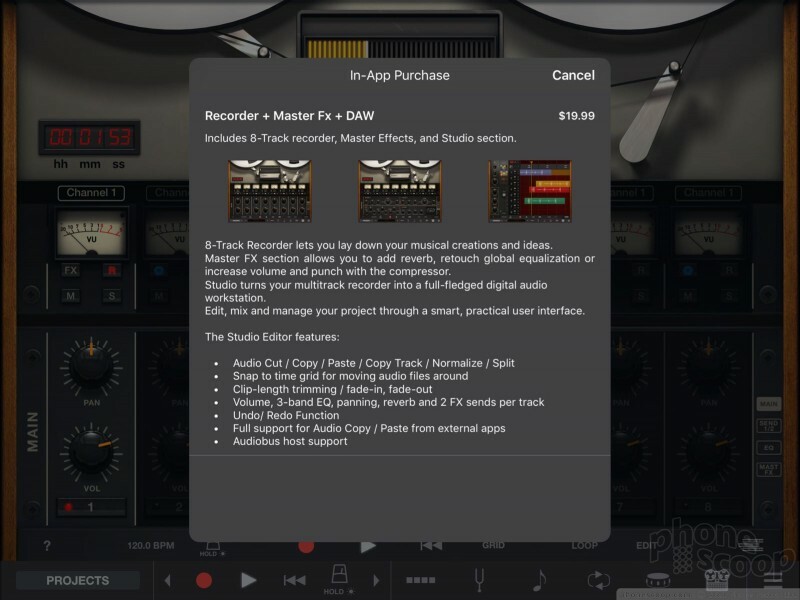 I'd rather pay $50 - $75 for an all-inclusive version of the app than cough up $3, $7, $10, $20, and $25 here and there to get many of the functions that GarageBand offers for free. 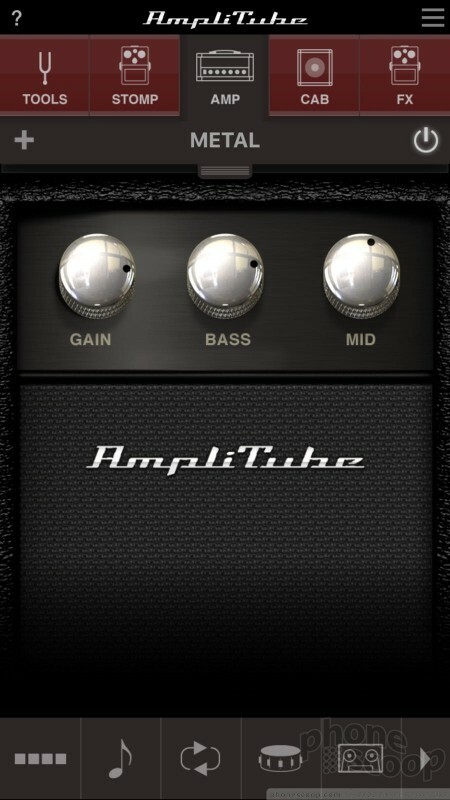 There's no doubt in my mind the iPad version of AmpliTube functions far better than the iPhone version. The expanded screen real estate resolves many of the UI problems I saw on the smaller device. It's much easier to tweak and play with on a tablet. 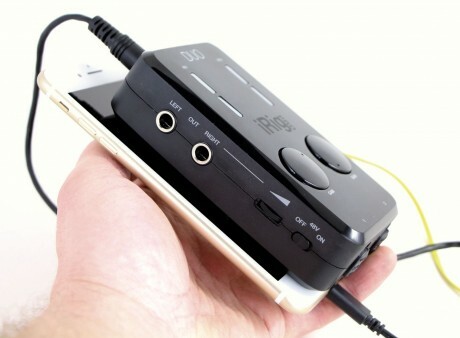 Thankfully, the iRig Pro Duo plugs into an iPad just as easily as an iPhone. 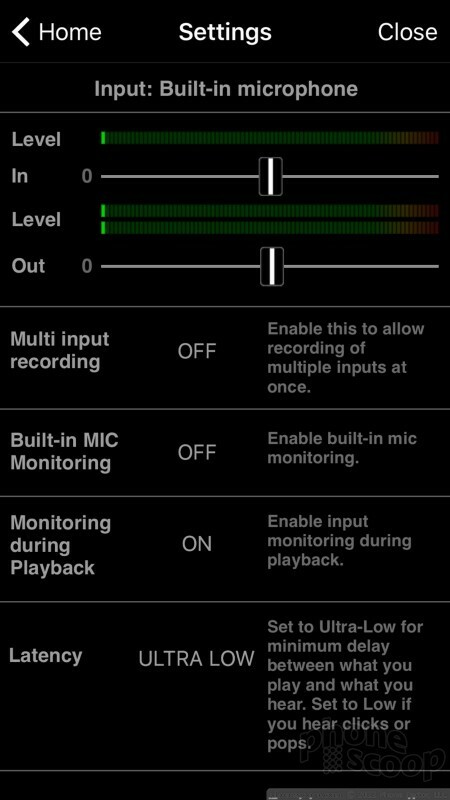 You can also use the Pro Duo with the more basic iRig Recorder app. 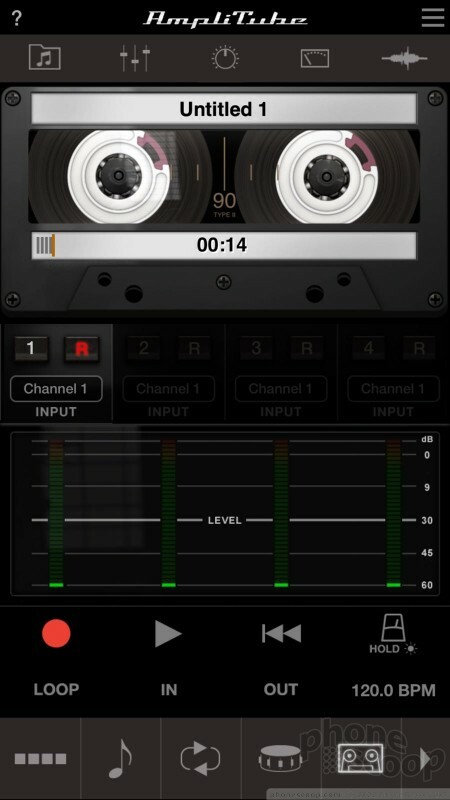 The iRig Recorder is a simple, single-track audio recording tool meant more for podcasts, perhaps, than music, but it works just as well with respect to capturing audio. I like the iRig Recorder a lot, as it's very powerful. I'll be offering a more in-depth assessment of iRig Recorder in a separate review along with some of IK Multimedia's microphones in the near future. 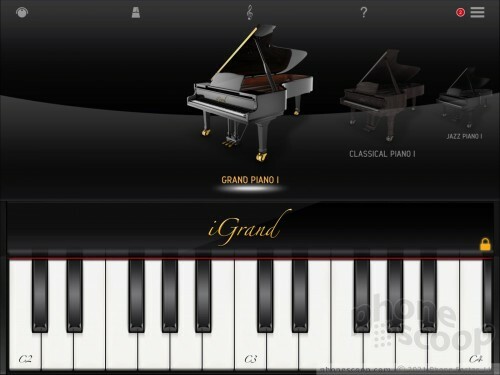 If you're a keyboard player, be sure to check out iGrand Piano. The app on its own is nigh but a simple grand piano app. 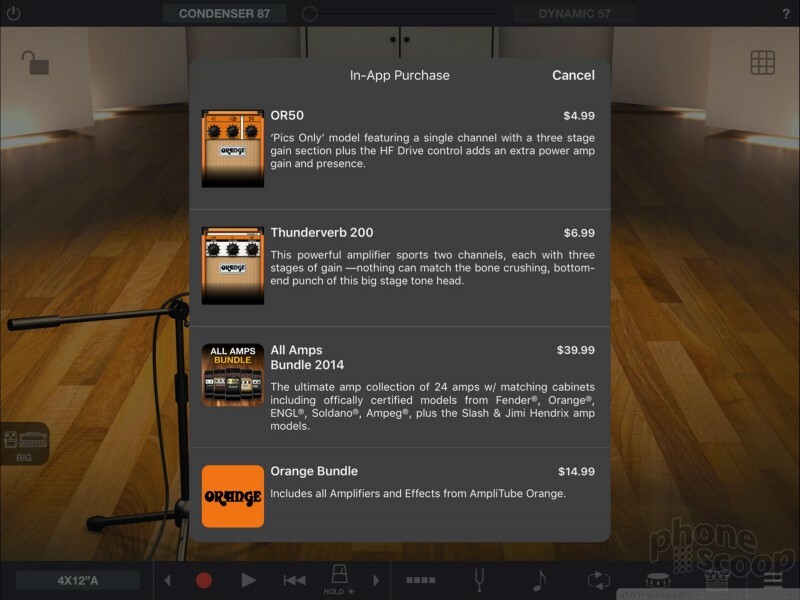 Like AmpliTube, you need to make a lot of in-app purchases to score more voicings and features. 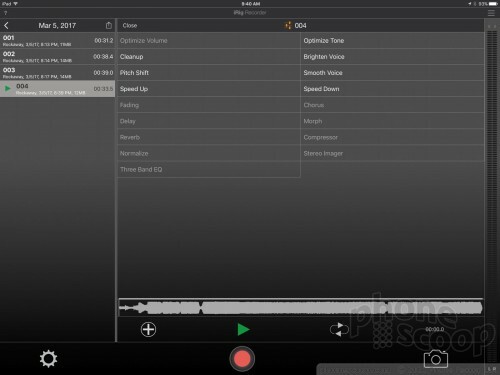 You can use iGrand Piano directly with IK Mulltimedia's media keyboard, or plug your own keyboard in directly with the Duo Pro and use iGrand Piano to record. 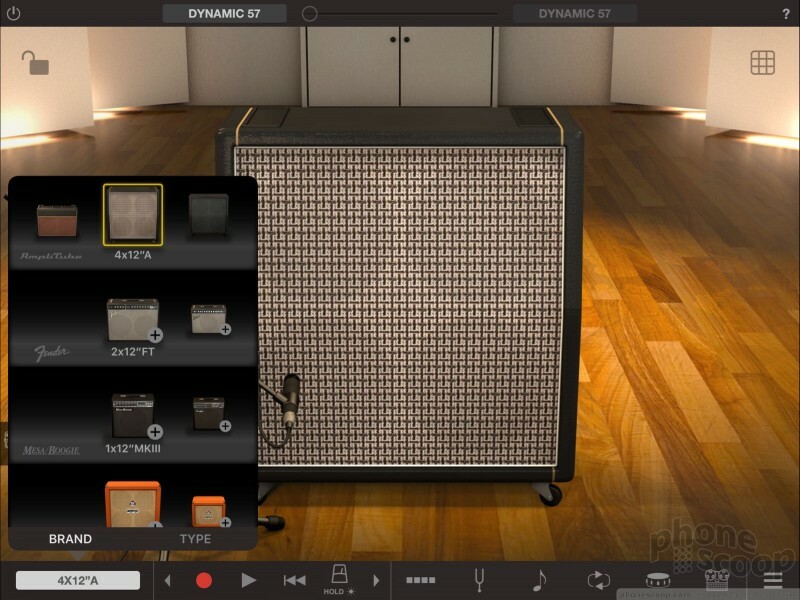 Then there's Apple's GarageBand. 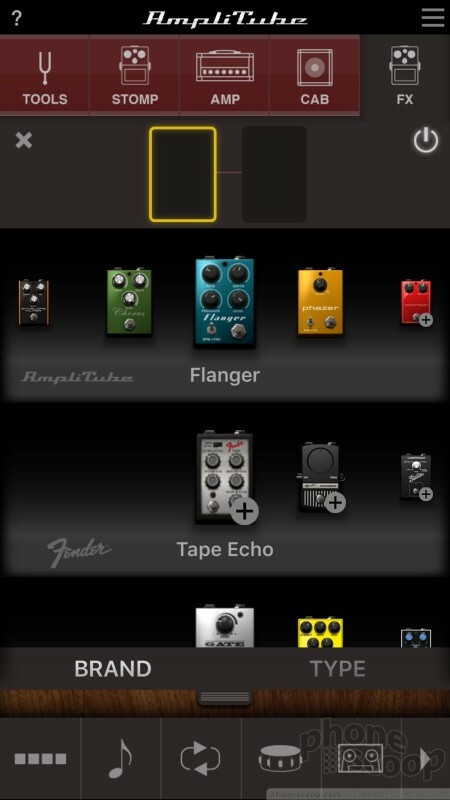 The iRig Pro Duo is a perfect companion to Apple's powerful music application. 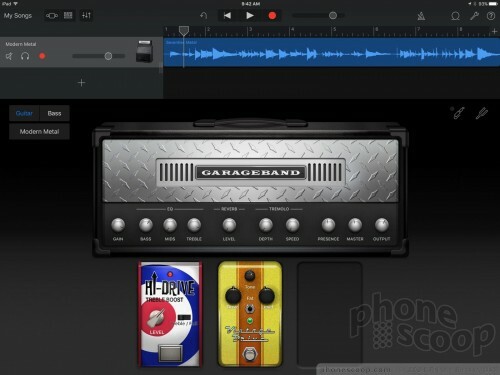 I had no trouble patching my guitar into GarageBand via the Pro Duo. 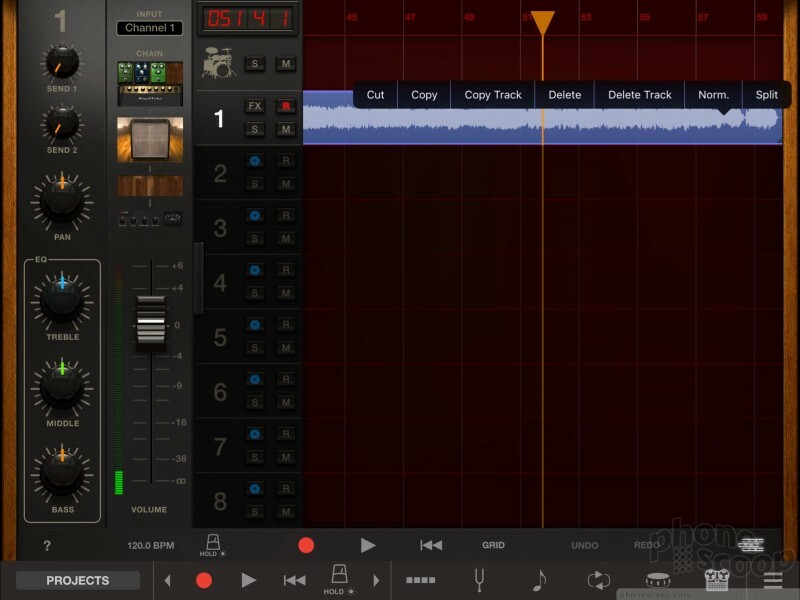 GarageBand has a wider number of included features (multitrack recording, advanced editing, myriad instrument voicings/styles) and is easier to use than AmpliTube, in my opinion. How does it sound? Pretty good. 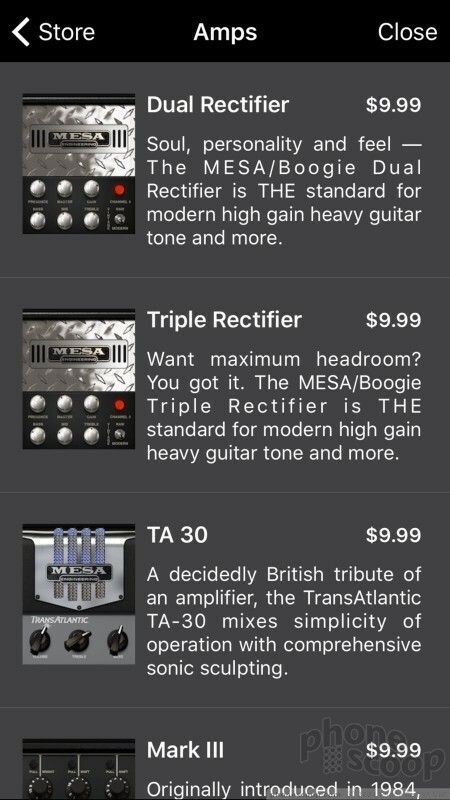 I mean, there's no question you're playing your guitar with software rather than a real amplifier, but the range of possible sounds — even if you don't buy any of the expansion packs — should satisfy most people when it comes to basic fiddling around. Of the four included amp voices I thought the clean sound was the weakest. It just isn't capable of delivering the rich tone I'm looking for. 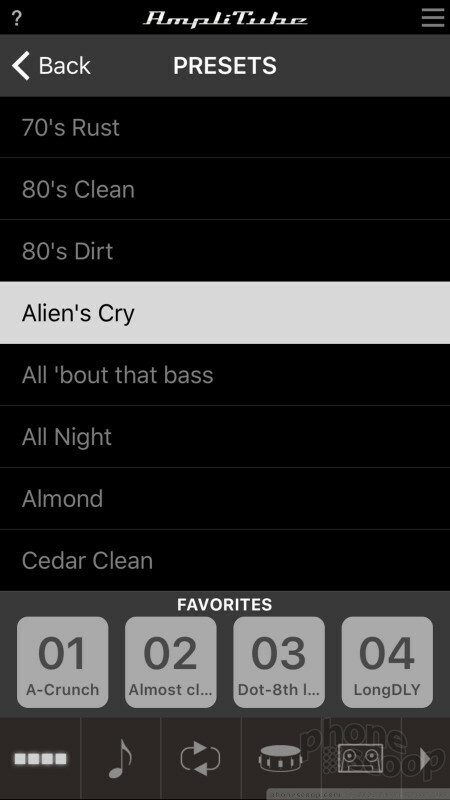 To be fair, GarageBand's clean voicings aren't much better. 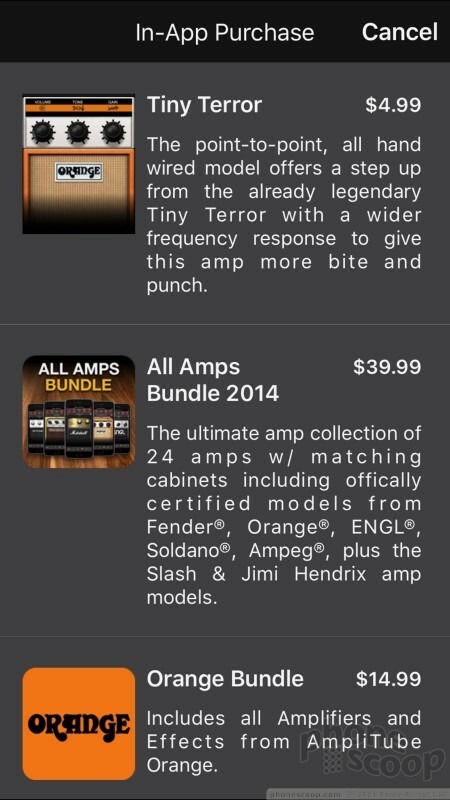 AmpliTube's crunch, lead, and metal amps have more bite to them and range from warm, bluesy purrs to intense roid-rage metal depending on what you care to dial in via the controls. 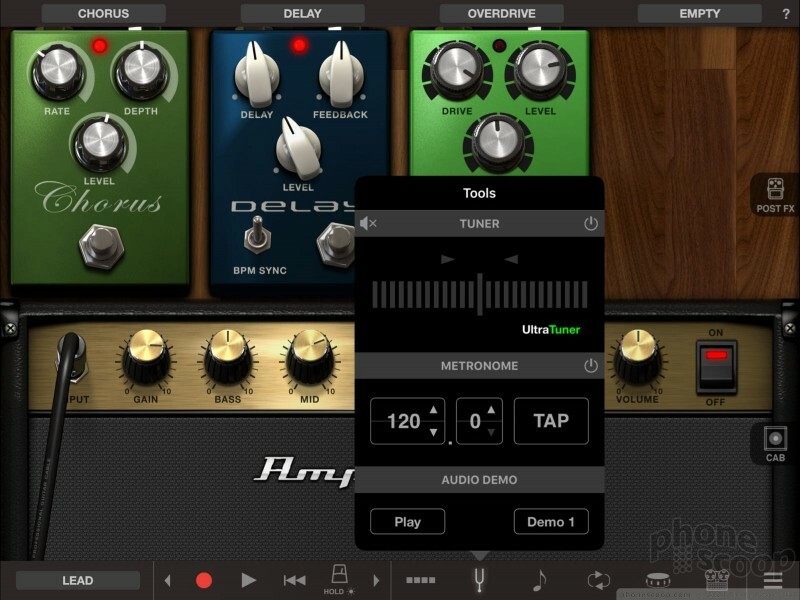 The Pro Duo and app together responded well to input from my guitar. Guitar techniques such as harmonics, pinch-harmonics, string bends, hammer ons/offs, and palm-muting sound just as they should. 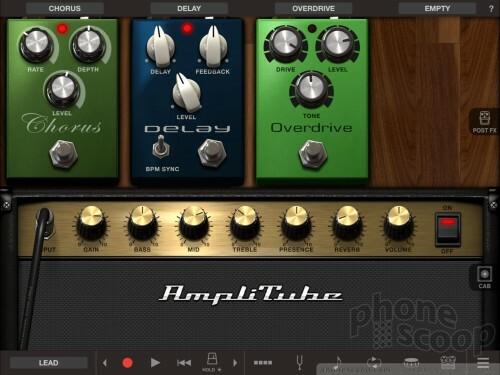 The Pro Duo helped me manage the differences in input signal from passive and active pickups, while adjusting tone and volume controls on my guitar helped me fine-tune input levels so I wasn't overpowering the software. Perhaps mostly importantly, the Pro Duo supports two instruments at the same time, which means you can record or jam with a friend. I tested the Pro Duo with two guitars, one guitar and a mic, and a keyboard and a mic and all three pairings worked perfectly. As noted, it does take time to adjust levels properly and find the right voices and sounds, but the rewards are worth it. 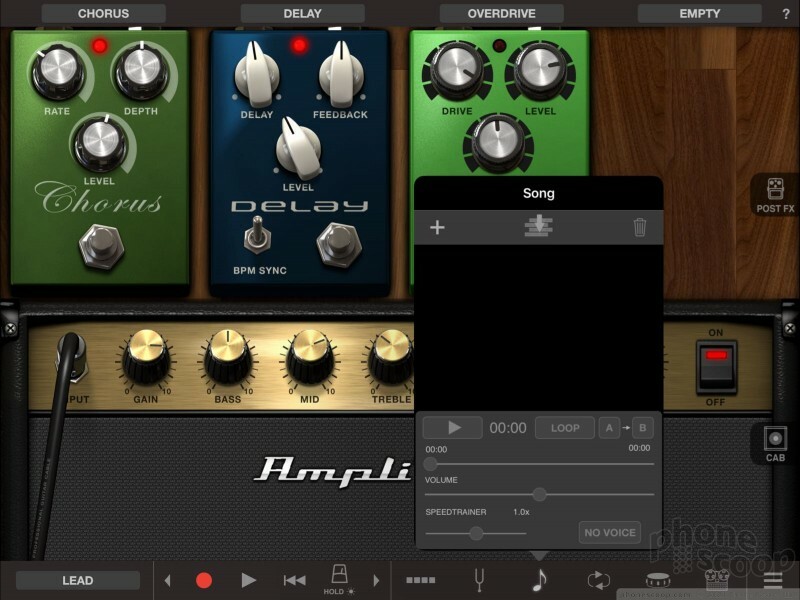 Keep in mind, however, that the free version of AmpliTube only allows you to record your two instruments together into a single track. 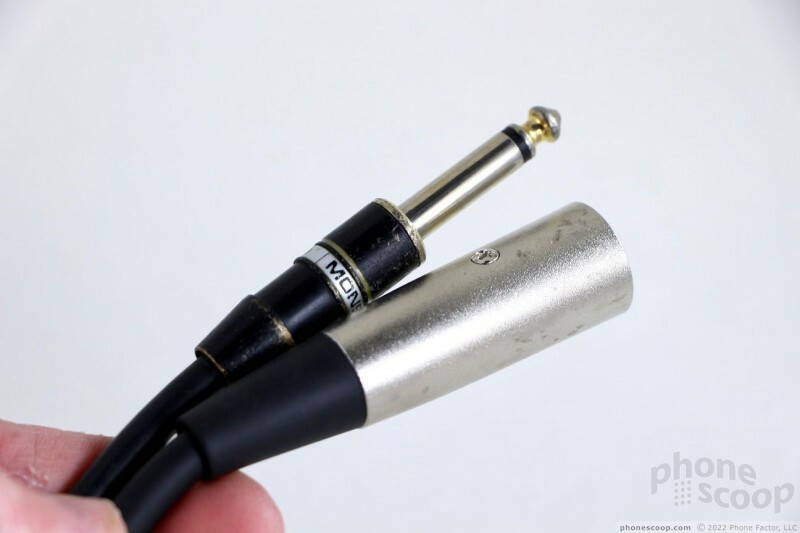 The right jack on my review unit was prone to dropping the signal when using Â¼-inch cables from time to time, but the left jack worked perfectly. 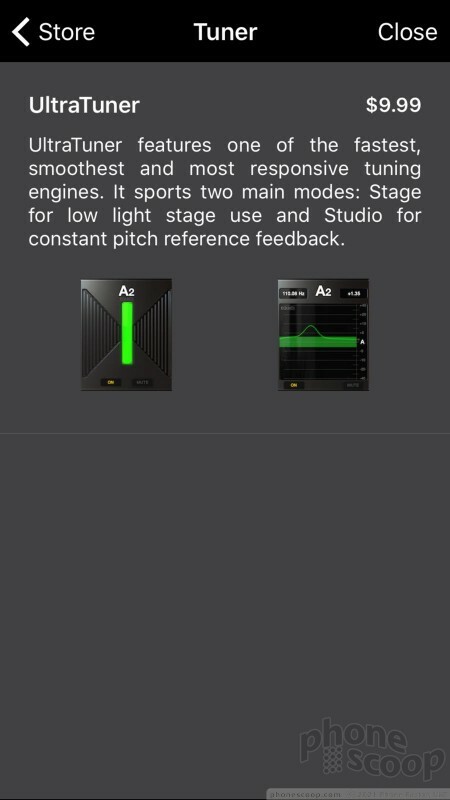 When the right jack dropped the signal, it broke the connection between the Pro Duo and the app on the iPhone, forcing you to re-pair the two. This was as a bummer. It's possible the right Â¼-inch connection on my review unit is buggy. Switching to XLR cables resolved the issue with the right jack. 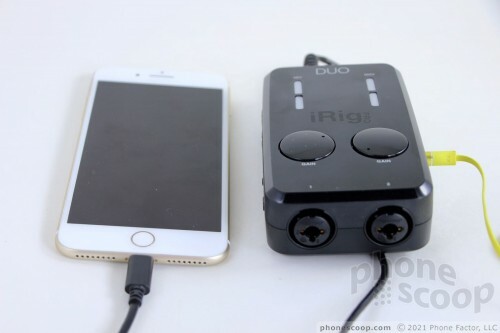 The iRig Pro Duo does let you patch a guitar, bass, keyboard, or microphone into your iPhone, iPad, Pac, PC, or Android device and record music. At its most basic marketing pitch, it wholly succeeds. 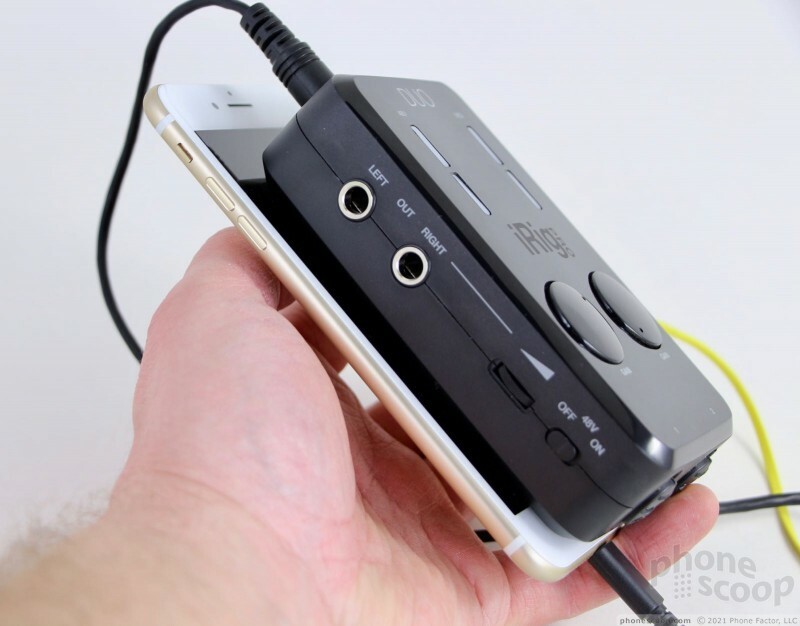 The iRig Pro Duo includes most any accessory or cable you might need to get going, and allows you to play guitar through your smartphone, tablet, or PC. 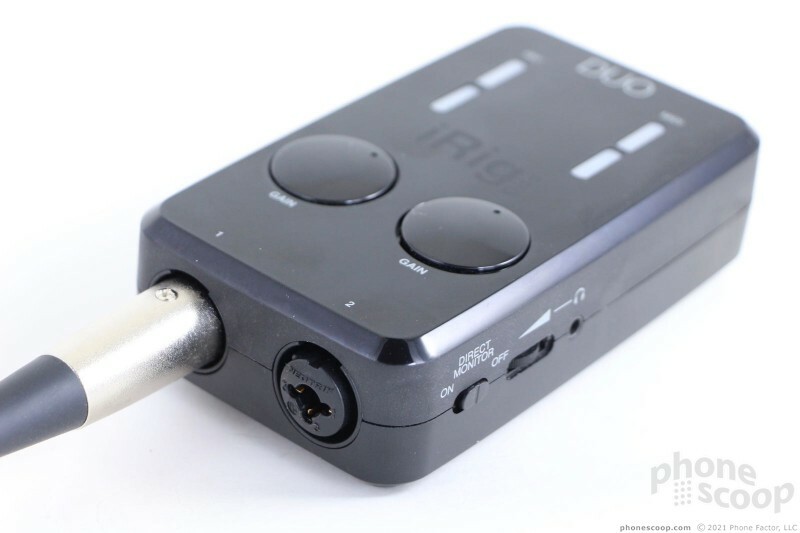 The iRig Pro Duo costs $200. IK Multimedia sells single-instrument connectors for about half as much. If you only play guitar or bass and have no intention of using more than one instrument at a time, maybe stick with one of the less-expensive options, like the $99 iRig HD or $149 iRig Pro I/O. 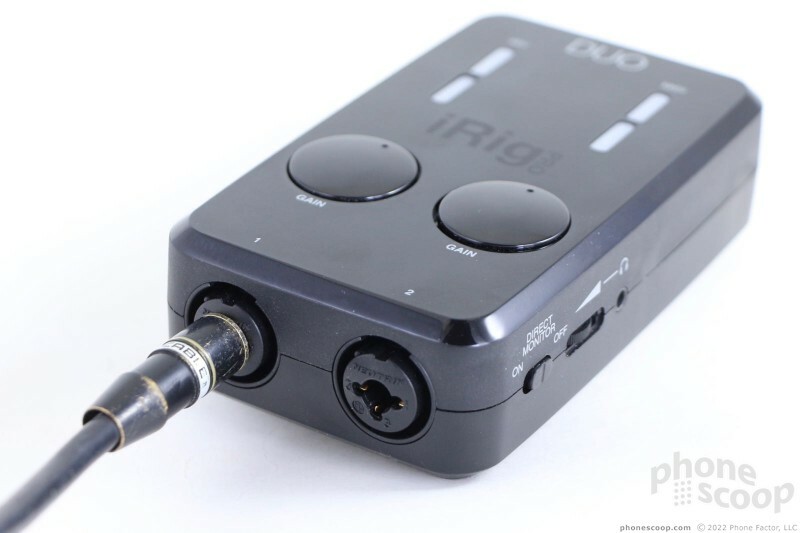 If you truly need an option to record two instruments at a time, then the iRig Pro Duo gets the job done. I do wish this $200 piece of equipment came with more included software from IK Multimedia. 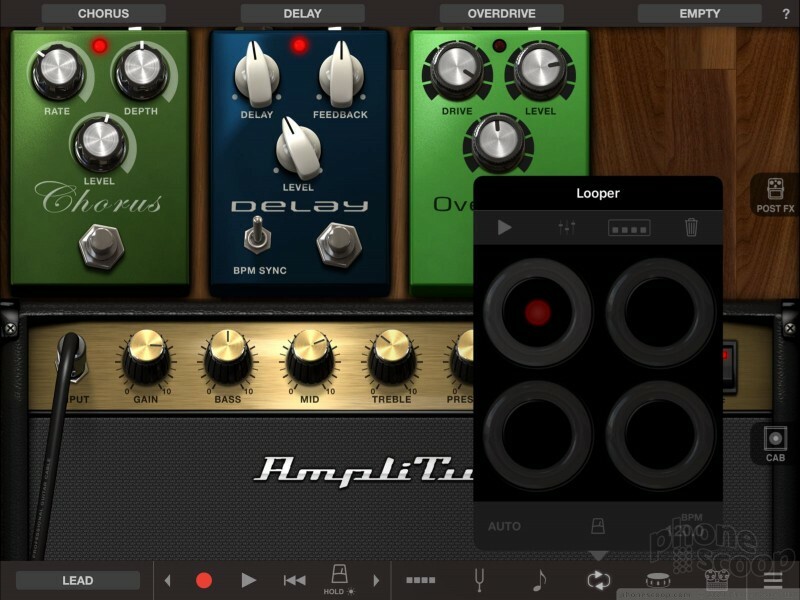 The free app suffices, but you can do a lot more if you pony up extra cash for amps, effects, and, perhaps most importantly, multitrack recording and editing. 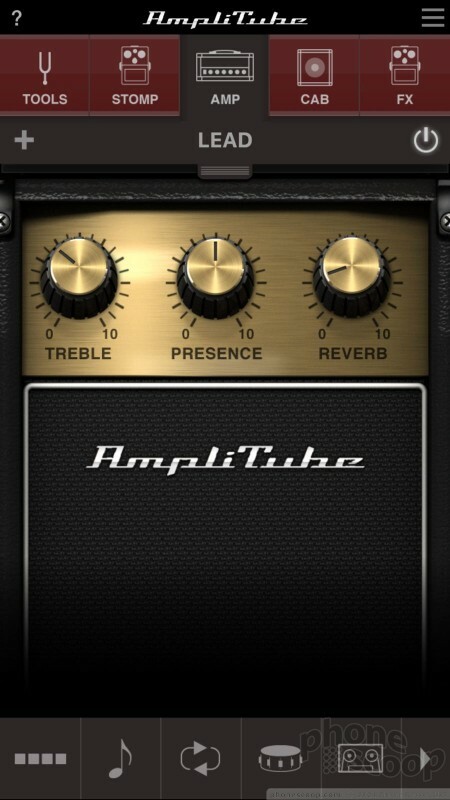 I prefer Apple's GarageBand application, but AmpliTube still covers the basics. 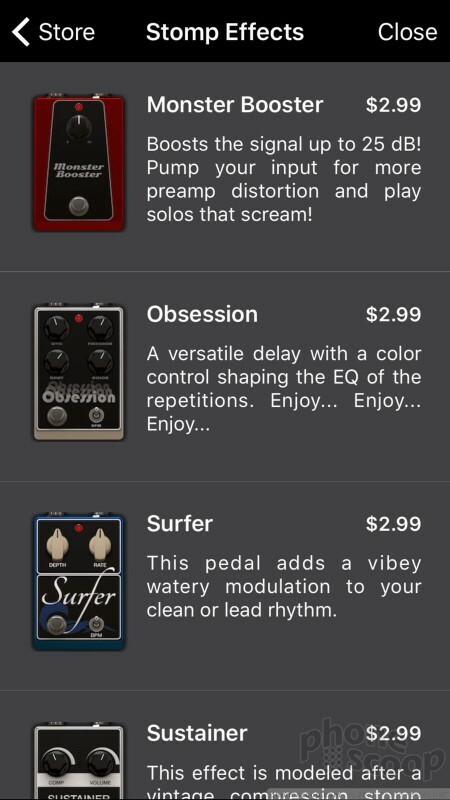 I was able to dial in decent tones and record them via the app, albeit one track at a time. 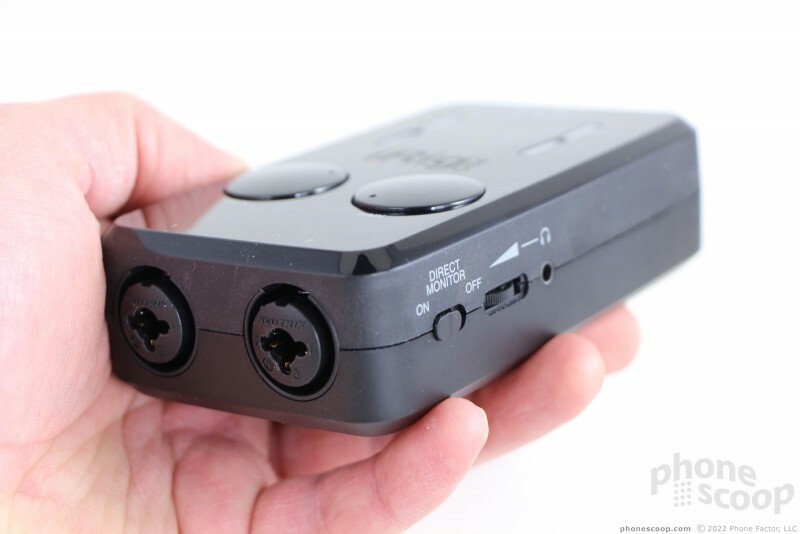 Does the iRig Pro Duo rock? Sure. Will it bring down the house? Almost.